Part of the Earagail Arts Festival, 10 to 26 July 2015 – two weeks of music, theatre, visual arts, film, literature, circus & carnival on Ireland’s North West Atlantic seaboard. It’s nearly arts festival time again! Have you downloaded the programme yet? We’re gearing up for a very busy and arts filled July here at An Grianán. We’re the official box office for the Earagail Arts Festival so you can buy tickets for events happening here in An Grianán and right across the county! Our festival events kick off on Sat 11 July with a night of stand up comedy from Neil Delamere who is back with his show The Fresh Prince of Delamere. He sold out last time to this is one to book your tickets in advance for! Full of bubbles and all the way from Italy is the wonderful family show Overture. From odd instruments giant bubbles appear, bouncing bubbles, portable bubbles, bunches of bubbles, so many bubbles! If you are very lucky you might even get to stand inside a giant, people-sized bubble! Comedy Can’t Pay? Won’t Pay! Next up we have the farcical comedy Can’t Pay? Won’t Pay! from newly formed local company Bread and Roses Theatre. Directed by Katheen McCreery, the excellent cast features Valerie Bryce, Margaret Hannon and Eoghan Mac Ghiolla Bhríde from last year’s hugely successful festival play, Fiesta, along with Paul Bonar (The 39 Steps) and Martin McGinley, best known as one of Donegal and Ireland’s finest fiddle players. Written by Dario Fo, the only actor to ever win a Nobel Prize, his plays are as fiercely provocative as they are funny, and as relevant today in Donegal as in Fo’s native Italy. Perennial favourite Little John Nee has reassembled his Caledonia Highly Strung Orchestra to present “Lough Swilly Delta Live”. In addition to songs from their debut album “Songs from the Lough Swilly Delta the show will feature their latest new compositions, musical stories, comedy and the drama of being highly strung on the road.A mixture of comic blues and haunted ballads, featuring songs from “The Derry Boat”, “The Mental”, “Dead Rooster Blues”, “Sparkplug” and others all given the “Highly Strung” treatment; the warm earthy guitars of Fionn Robinson, the Ella-mental voice and kaleidoscopic clarinets of Orlaith Gilcreest, the pulsing piano and hair-blowing Hammond of Jeremy Howard as well and Little John’s trademark ukulele and cigar box guitar. Bachelors Walk Productions presents The Dubliners Dilemma based on Dubliners by James Joyce. An Grianan Theatre Letterkenny July 2015. Earagail Arts Festival. Drama. 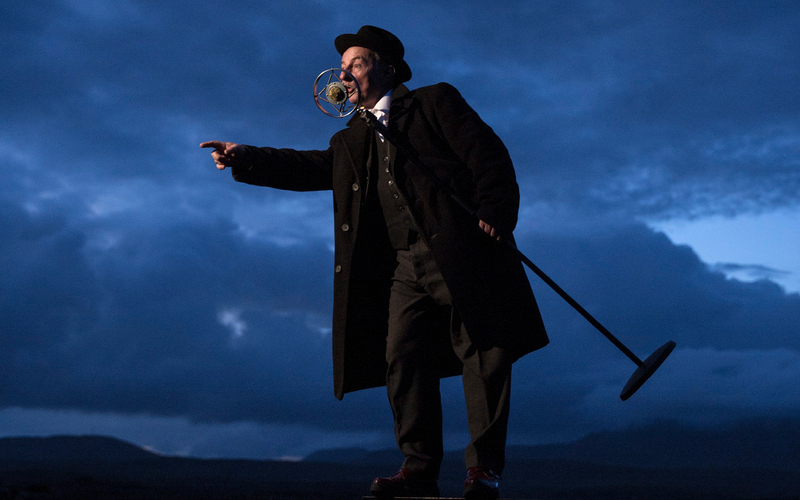 The Dubliners’ Dilemma is an acclaimed one man show that brings the stories and controversies of James Joyce’s remarkable first book “Dubliners” to vivid life. The year is 1914. London publisher Grant Richards has determined to re-read Joyce’s controversial manuscript, eight years after rejecting it over fears it might breach strict British and Irish obscenity laws. Should Richards be the one to risk everything now, second time around, and launch this volatile but brilliant genius on a world about to descend into the madness of war? We’re delighted to welcome back Banyan Puppet Theatre. Banyan’s beautifully crafted and imaginative shows were one of the talking points of our festival shows last year, delighting young and old alike. This year they are presenting two new shows: The Elves and the Shoemaker and The History of Tom Thumb. Ideal for younger audiences and their families. On the heels of the marriage equality referendum, Rough Magic’s How to Keep an Alien is very topical! The List have named this as one of the must see shows of the upcoming Edinburgh Fringe Festival – but why go all the way to Scotland when you can come and see it here! ‘How to Keep an Alien’ is a funny and tender autobiographical tale in which Irish Sonya and Australian Kate meet and fall in love, but Kate’s visa is up and she must leave the country. Together they must find a way to prove to the Department of Immigation that they have the right to live together in Ireland. And it isn’t going to be easy! Our visual arts exhibition this year is ‘Donegal – Home‘ and features work by artists who are either from Donegal or have chosen the county as their home. Artists include Paul Rooney, Richard Wayman, Declan Doherty, Simon Birch, Denzil Browne, Jan Voster, Katrina Quille, Cathal McGinley, Ian Gordon, Johnny Boyle, Una Campbell and Caitlin Gallagher. There are loads more events happening across the county – check out the official Earagail website for the full list of events! Thur 16 & Fri 17 July, 8pm: Can’t Pay? Won’t Pay!